Note to the Press: Please include the following statements from Gov. Eric Holcomb, House Speaker Brian C. Bosma (R-Indianapolis) and Senate President Pro Tem Rodric Bray (R-Martinsville) in your coverage of the Senate’s passage of Senate Enrolled Act 198. The bill allows a judge to consider at sentencing whether a crime was committed with bias or because of a victim’s “real or perceived characteristic, trait, belief, association or other attribute,” which Republican leaders said ensures every Hoosier is covered under the law. The measure also defines “bias crimes” as a crime against someone based on their color, creed, disability, national origin, race and sexual orientation. These categories are already listed in Indiana’s nearly 20-year-old bias crimes statute. STATEHOUSE (April 2, 2019) – After passing through the Senate and House, legislation sponsored by State Rep. Ron Bacon (R-Chandler) giving health care providers an exemption from performing or assisting in abortion procedures could soon be law. Indiana is home to over 1 million students and 70,000 teachers. This session, legislators brought forth various proposals to support educators as they prepare students for success. I am sponsoring legislation that would increase the tax credit teachers use toward classroom materials and provide schools more flexibility when it comes to compensating educators. STATEHOUSE (April 2, 2019) — Local graduates are gaining experience as interns with State Rep. J.D. Prescott (R-Union City) and his fellow members of the House of Representatives during the 2019 legislative session. 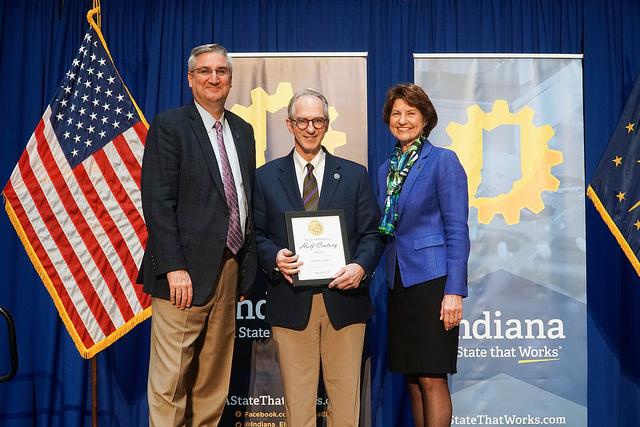 STATEHOUSE (April 2, 2019) — Cummins Inc. recently received the Governor’s Century Business Award for being in operation since 1919, according to State Rep. Ryan Lauer (R-Columbus). 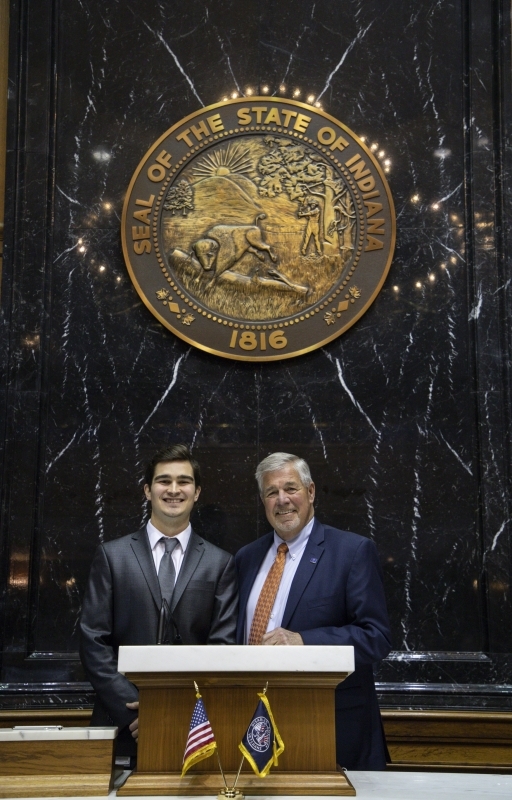 STATEHOUSE (April 2, 2019) — A New Palestine High School graduate is gaining experience as an intern with State Rep. Bob Cherry (R-Greenfield) and his fellow members of the House of Representatives during the 2019 legislative session. STATEHOUSE (April 2, 2019) – State Rep. Brad Barrett (R-Richmond) recently welcomed local student pages to the Statehouse. 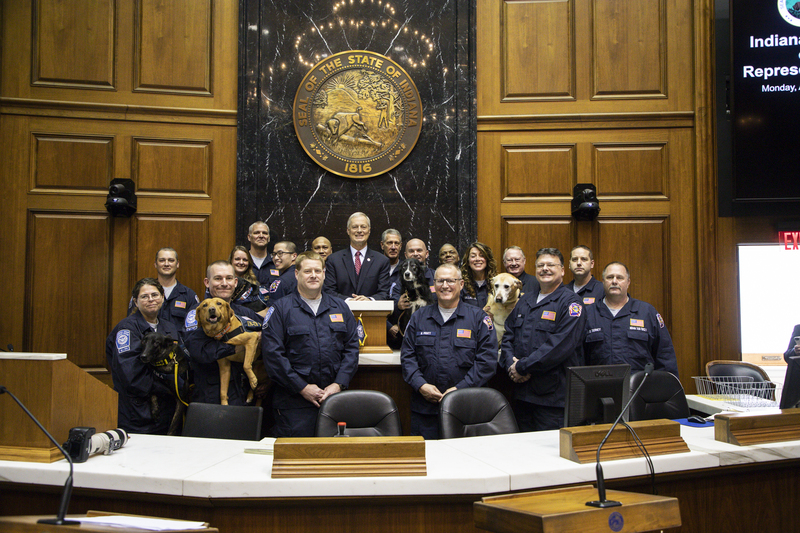 STATEHOUSE (April 2, 2019) – State Rep. Randy Frye (R-Greensburg) recently honored Indiana Task Force One at the Statehouse for their services around the country. 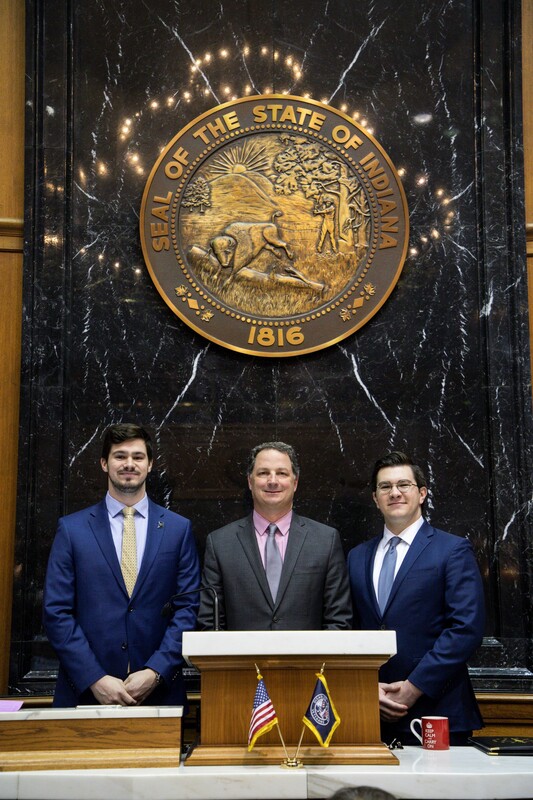 STATEHOUSE (April 2, 2019) — The Indiana Senate recently supported State Reps. Mike Karickhoff (R-Kokomo) and Heath VanNatter’s (R-Kokomo) legislation that would permit the Howard County courts to appoint a magistrate to assist with cases. I have devoted most of my life to education, and I continue to do everything I can as a lawmaker to support both students and teachers. I am sponsoring several Senate bills to better serve students after they graduate and streamline teacher training requirements. When students graduate from high school, they are often unsure of what they want to do next in life. I am sponsoring Senate Bill 158 to develop the Indiana Youth Service Program for recent high school graduates. This program would provide young Hoosiers an opportunity to explore growing career options in Indiana, learn various skills and figure out their next step. 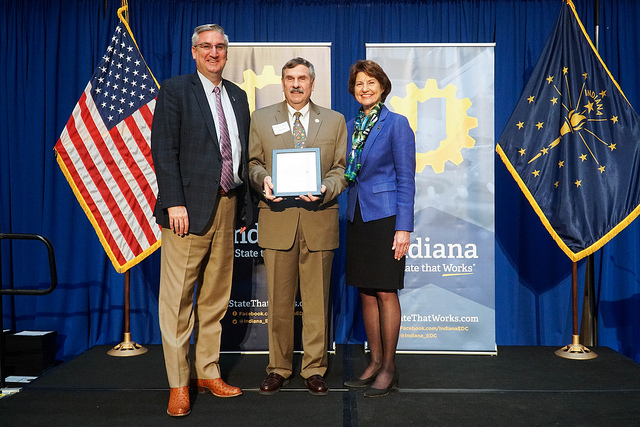 STATEHOUSE (April 2, 2019) — Claeys Candy, Inc. in South Bend recently received the Governor’s Century Business Award for operating since 1919, according to State Rep. Dale DeVon (R-Granger). 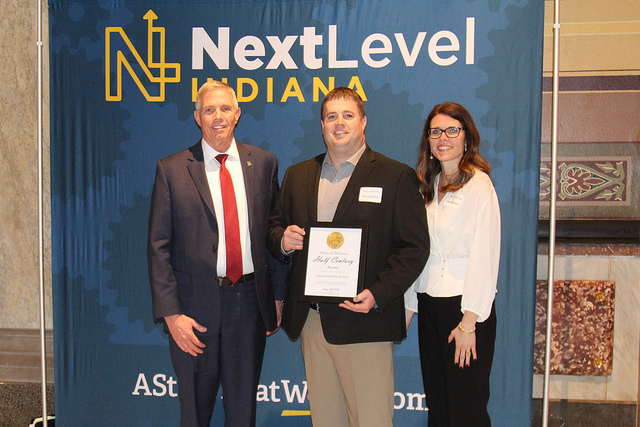 STATEHOUSE (April 2, 2019) — Lewger Machine & Tool in Kendallville recently received the Governor’s Half Century Business Award for operating since 1951, according to State Rep. David Abbott (R-Rome City). 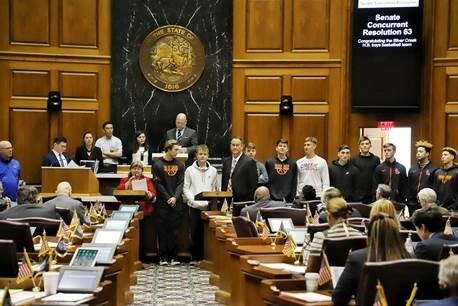 STATEHOUSE (April 2, 2019) — State Rep. Dave Wolkins (R-Warsaw) honored the Emmanuel Christian High School boys’ basketball team and girls’ volleyball team at the Statehouse for their state championship wins. 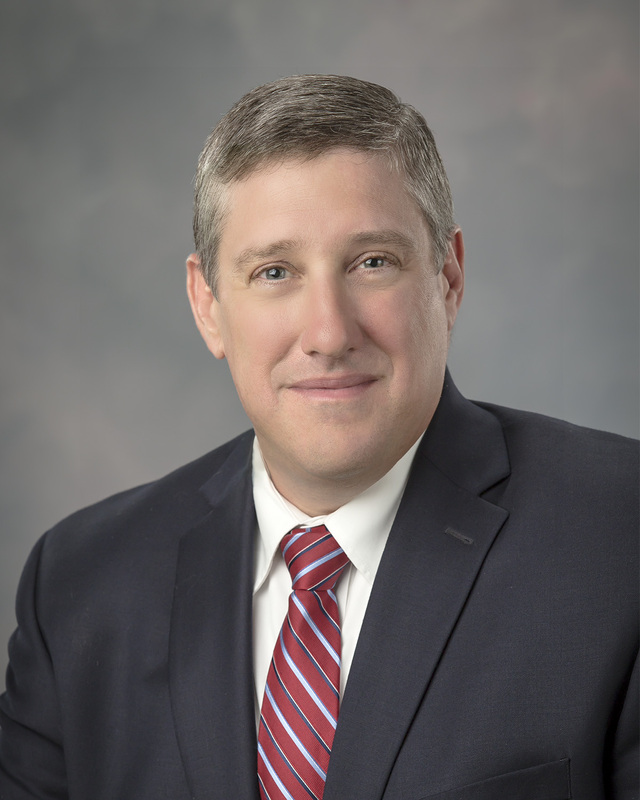 STATEHOUSE (April 2, 2019) – The House of Representatives and Senate recently approved legislation sponsored by State Rep. Ben Smaltz (R-Auburn) in an effort to improve office-based opioid treatment centers. 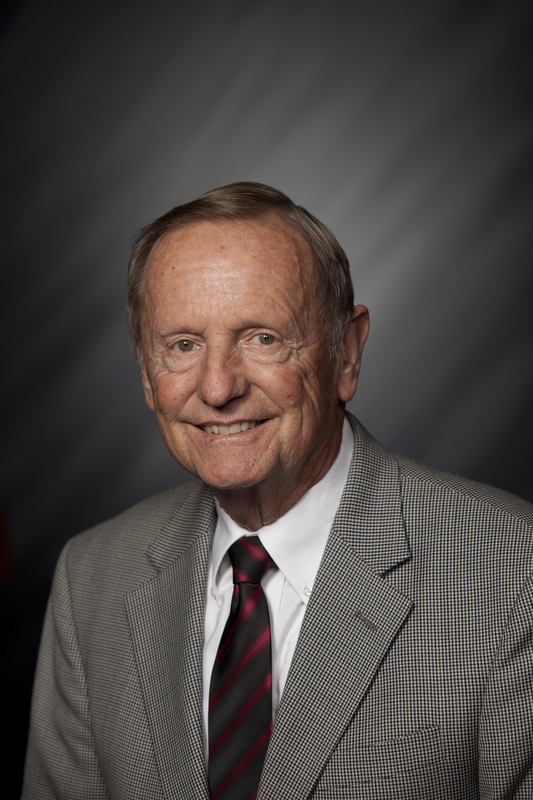 STATEHOUSE (April 1, 2019) – On My Way Pre-K applications for the 2019-2020 school year are now available for Marion County 4-year-olds, according to State Rep. Bob Behning (R-Indianapolis). Burton: Can you pass the U.S. citizenship test? Did you know the answers to these questions? If you did not know that the president of the United States is the commander in chief of the military or that the Constitution was written at the Constitutional Convention in 1787, then you might have difficulty passing the U.S. citizenship test. 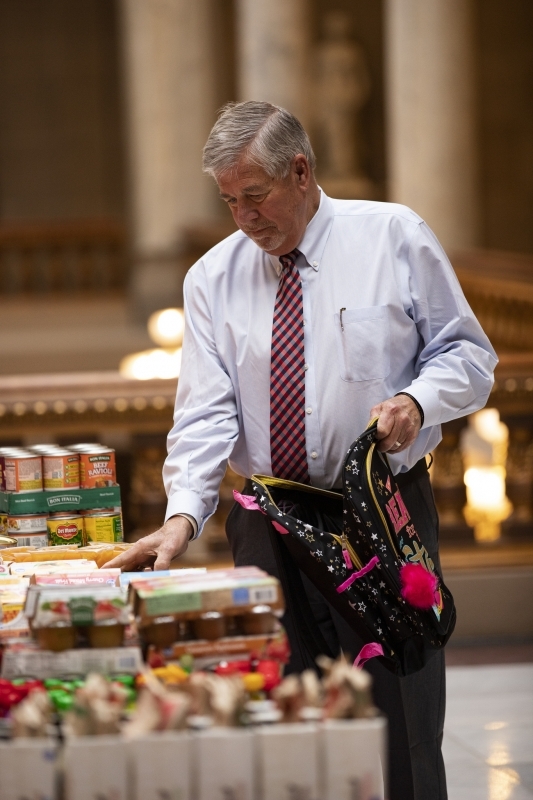 More than 900,000 people struggle with hunger in Indiana. The Salvation Army assists underserved people with a wide spectrum of resources like food drives, emergency responses and even emotional and spiritual support. With nearly 17.4 million American families going to bed without food each evening, the Salvation Army also helps combat hunger by providing nearly 156,000 nutritious meals each day to anyone in need. 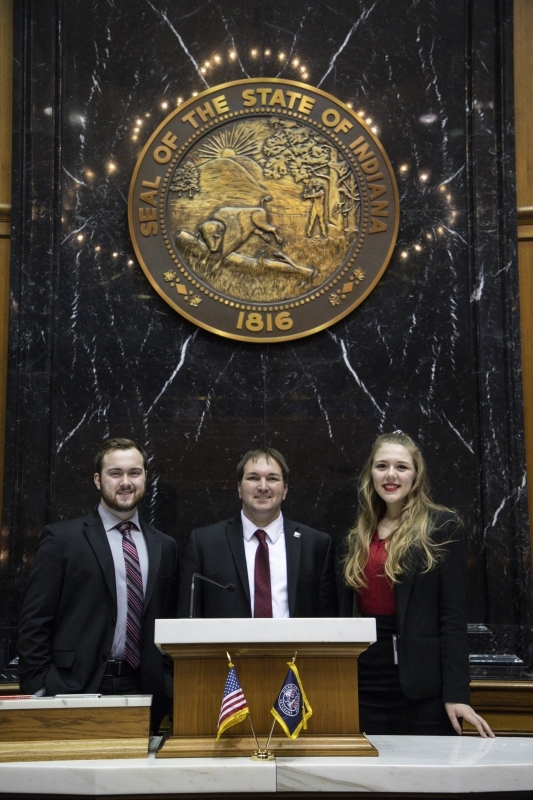 STATEHOUSE (April 1, 2019) – Two Cathedral High School graduates are gaining experience as interns with State Rep. Todd Huston (R-Fishers) and his fellow members of the House of Representatives during the 2019 legislative session. Max and Owen Adams, residents of Indianapolis, are the sons of Dave and Aileen Adams. Max is currently a law student at the Indiana University McKinney School of Law, and earned bachelor’s degrees in English and public policy from Indiana University Bloomington. As a policy intern, he analyzes amendments and bills, prepares committee reports for legislators, researches Indiana Code and is a bill reader on the House Floor. Owen is an Indiana University Bloomington graduate with a bachelor’s degree in journalism and a minor in history. He works as an intern in the House Majority Communications Office, where he writes press releases, creates legislative handouts and assists with media relations. 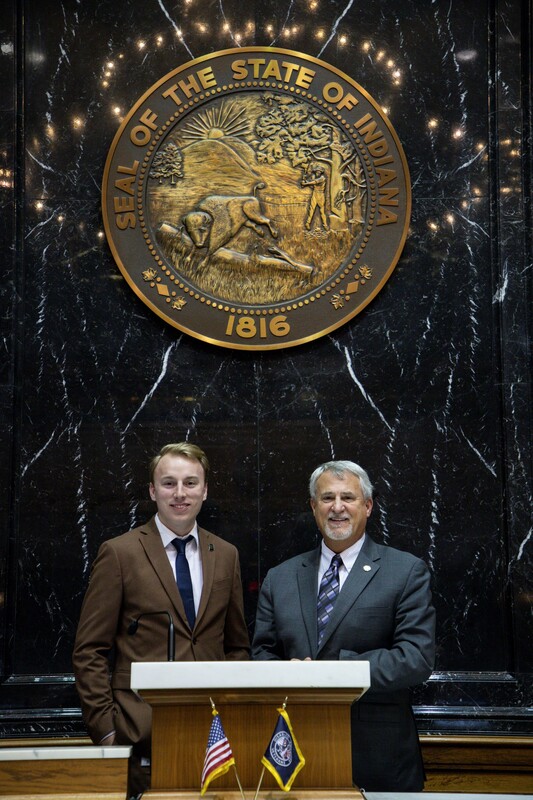 STATEHOUSE (April 1, 2019) – A graduate of Eastern High School is gaining experience as an intern with State Rep. Mike Karickhoff (R-Kokomo) and his fellow members of the House of Representatives during the 2019 legislative session. Tristen Moyers, a resident of Greentown, is the son of Trever and Shelly Moyers. He attends Indiana University Kokomo where he is majoring in history and political science. As a legislative intern, Moyers corresponds with constituents through phone calls, letters and emails while also staffing committee hearings and floor proceedings. STATEHOUSE (April 1, 2019) — Lonsbury Garage in Angola recently received the Governor’s Half Century Business Award for operating since 1951, according to State Rep. Denny Zent (R-Angola). STATEHOUSE (April 1, 2019) — Amish Acres in Nappanee and Wawasee Boat Company in Syracuse recently received the Governor’s Half Century Business Award, according to State Rep. Curt Nisly (R-Milford).